To kick start, you've gotta lock those pores away and prep the skin. My skin primer of choice is The Body Shop Tea Tree Pore Minimiser. If you're a regular to these spaces, you'll know I'm a huge lover of this. It's basically a gel version of the Benefit Porefessional which we all know is a cult classic really, let's get real gals. This just glides on the skin, smoothes everything out but still doesn't feel pore clogging or break you out. Bingo. Sticking to the topic of primers, as a side note, I also love Benefit Stay Don't Stray Eye Primer. It's great for covering up those ugly veins by evening out the skin tone and stopping all that creasing, slipping and sliding. And lemme just say, I've been using this sample everyday since 4 Birchboxes or so ago and it's still going strong it's pretty much like Narnia! Next up is my favourite, ever, which goes by the name of Revlon Colourstay Foundation in Buff. This most definitely ain't for you ladies who like a light coverage. Combining this with my Ruby and Millie Foundation Brush gives a mega heavy coverage, I mean like photoshoot / red carpet / camera ready full coverage face that all those airbrush lookin' celebs pull off on a press day. But if you whack this on with the trusty Real Techniques Buffing Brush you're off to a good, everyday foundation which is non-comedogenic (aka. non-pore clogging and perfect for you acne prone kiddos). Love. Now if that ain't quite enough and you've still got those red pimples standing out or need a bit of Kimmy K highlight then just have Collection Lasting Perfection Concealer in Fair on the ready. If you go up a colour you could use it to highlight, or just stick to your trusty colour and wave chow to those red blobs gone. Before you powder (I use either Soap and Glory One Heck Of A Blot or Rimmel Stay Matte powders, see the post here) you need that Bronzing Primer under wraps. Now honestly ladies, this makes such a difference. I grab one of the Benefit Powder Type Brushes, and just do a heavy contour with Bourjois Bronzing Primer (basically the Chanel dupe FYI) on my temples, cheek bones, nose and hairline then just blendy blend blend with my Real Techniques Brush. 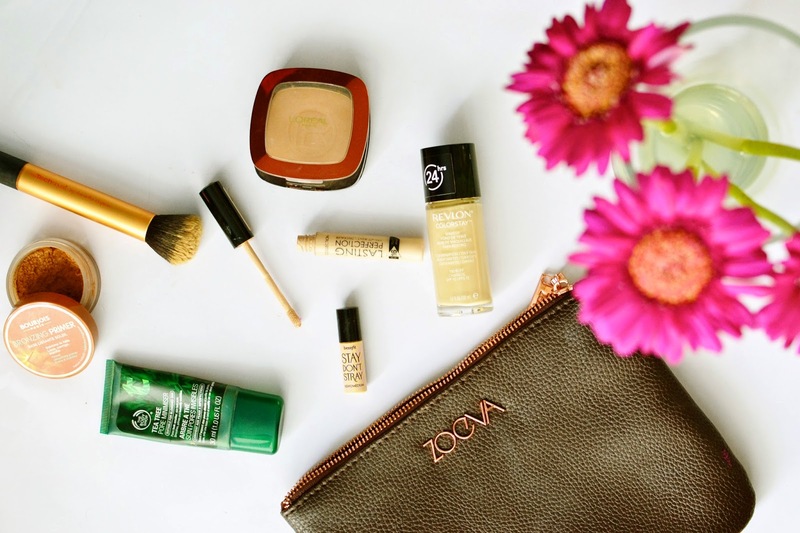 Then powder up, and whack on the L'oreal Glam Bronze in Blonde Sun with your trusty contour brush of choice (I use the one from the Zoeva Rose Gold Brush Collection, stunning). This is such a natural bronzer, and provides a great colour for both the good ole bronzing up but also contouring that is so natural. Not too orange, not too cool toned, not too muddy. Perfection! That's pretty much my kit for a flawless face. You can't really go wrong, all available from the drugstore and not too pricey. Winner! So you Medium / Heavy coverage ladies, look this way and take note! What is your kit for a flawless face fix?